Looking for something fun to do in Glasgow this summer? Our family friendly fun day will be held on Sunday the 24th June 12-6pm in the heart of Glasgow's west end. On the day, we'll be taking over Vinicombe and Church street, both located just off Byres Road. The day will be filled with lots of fun activities to keep the kids (and adults) entertained and we will have a land train travelling along Byres Road to take you to both locations. Spend a lazy (hopefully sunny) Sunday afternoon listening to local Glasgow musicians perform live on our stage, whilst the kids enjoy free face painting and entertainment. When hunger strikes, you'll find a fabulous selection of food and drinks along Byres Road and in the surrounding lanes. Our traders will also be setting up stalls at our summer market, with an array of gifts, crafts and antiques, showcasing local west end businesses. 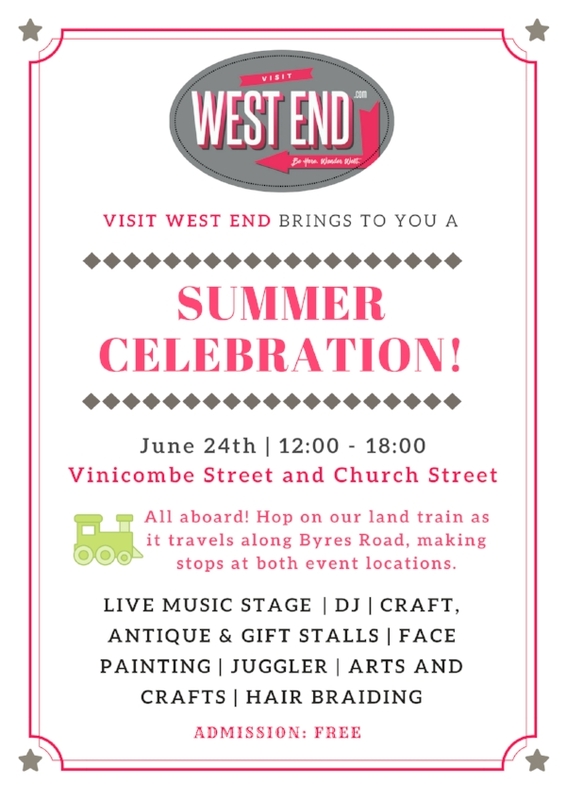 So pop the date in your diary and join us for a summer celebration!